In a sauce pan, add the oil and sweat the shallots, garlic, lemongrass and ginger. Next add the peppercorns and sweat another 2 minutes. Add the hoisin, coconut milk, rice vinegar and fish sauce. Simmer for 30 minutes and finish with lime juice. Reserve. In a steamer, cook the sticky rice for about 40 minutes or until done. Next move the rice to a bowl and stir in the coconut milk and season with fish sauce. Wrap in banana leaf or place in a cup and reheat in a microwave or steamer. In a pot, heat the rice vinegar, salt and sugar. Pour over the cucumber and chill immediately. Serve cold. Brush one side of each prawn and season the other. 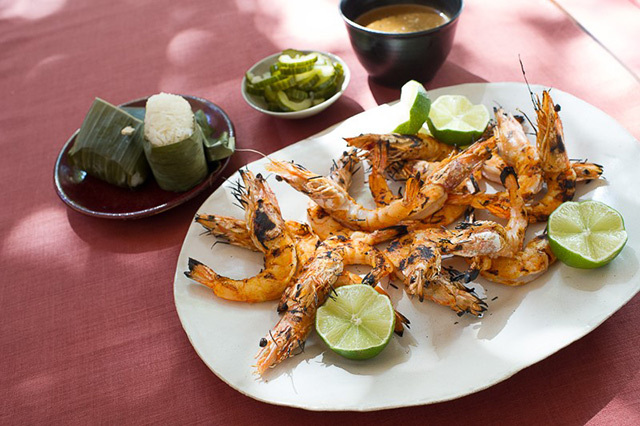 Cook the prawns on a hot grill about 3 minutes on each side. Serve with the sticky rice, black pepper sauce and pickled cucumber on top.